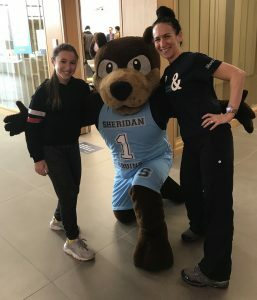 Dean Yael Katz (R) and friends at Sheridan’s Fall 2018 Open House. Where to begin? A Scotiabank Giller Prize Finalist, a Creative Humanities project launch enabled by the coveted College & Community Social Innovation Fund (SSHRC), a poetry book, a textbook, stories, more stories, readings, interviews, teaching and learning innovations, creativity workshops, creativity everything, new ideas, new ways of thinking, new colleagues, new beginnings. In short, nothing new. Not to mention an amazing Open House on Nov. 7, and an altogether outstanding semester. These are just some of the topics covered in this issue of Alchemy and celebrated in the Faculty of Humanities and Social Sciences this semester.